The chaste tree is a sprawling plant that grows 10-20 ft (3-6 m) and about as wide. Branched flower clusters are produced on new wood in late spring and early summer in a great flush that makes the tree look like a hazy purple cloud. It continues to bloom sporadically until early fall. Not only is the tree strikingly beautiful when in full bloom, but it is also fragrant and attracts pollinating bees and hummingbirds make hungry visits. Flowers are followed by a fleshy fruit that contains four seeds that are sometimes used as seasoning, similar to black pepper (monk's pepper is another of this species' common names). Flower color ranges from violet to blue to deep purple. Ecological Threat: Out competing native vegetation. History: The species name Agnus castus originates from the Greek agnos castus, meaning chaste, as the Greeks thought the plant calmed sexual passion. Its common name of caste berry and monks pepper also gives some indication of its historical usage. U.S. Habitat: Found in limestone outcrops and dry creek beds throughout Central Texas. Alfred Rehder.1967. Manual of Cultivated Trees and Shrubs: Hardy in North America. The MacMillan Co., New York. Floridata. 2004. 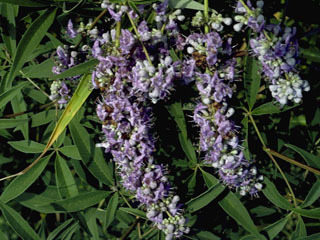 Vitex agnus-castus. (Accessed 20 August 2010: http://www.floridata.com/ref/v/vitex_a.cfm).